Physics isn’t about out-of-this-world things like flux capacitors and trips across the eighth dimension: it’s as in-this-world as you can get. 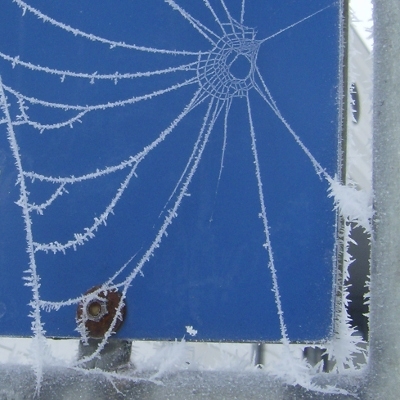 It’s a fascination with all the little things that our world does, such as ice crystals growing on a spider web on a signpost (pictured above). Imagine for the moment that you’ve been transported to a surreal world where everything works a little differently than you’d expect, or at least takes you by surprise. At first, you can’t help but notice the clam-flowers, circular rivers, and trees made from holes in the sky. But if you spend a long time there, those idiosyncrasies could become the new normal: there’s a danger of taking it for granted. Have you ever noticed rainbows in your icewater? Or the musical chords an underpass makes when the wind blows through it? Have you ever heard a staicy radio suddenly become clear when you touch it, and thought, “Those radio waves are coming in through me!” There’s nothing eccentric about turning the glass to see how the light goes through it, and it’s not too weird to hold a cat up to the radio, just to see what will happen. This is the essentially human act of doing physics: it’s as natural and as relevant to our lives as the study of water would be to fish. Cutting-edge physics research in the seventeenth century was a lot like these examples: that’s the time when research was just starting to be organized into controlled experiments. This era conjures images of Galileo at the top of the Tower of Pisa, dropping two balls of different weights and saying, “See? I told you so!” Actually, he rolled the balls down inclined planes and repeated the experiment enough times to accumulate confidence. As a stopwatch, he put water in an elevated bucket and let it pour out. He and many other natural philosophers were building the methodological techniques that make results reliable, yet the impetus to do so was still based on this human curiosity about the world that we find ourselves dropped into. As the boundaries of the communal knowledge grew, the experiments became more intricate and the ideas about what they mean became more subtle. At some point in the early twentieth century, the physics community broke off from the general intellectual community in the sense that non-physicists no longer believe that they know what physicists do. It became magic. It’s easy to see why: that was when physicists started making outrageous claims about basic philosophical concepts like space and time curving and bending, about objects existing and not existing simultaneously, and then backing up those claims with demonstrations like atomic bombs, lasers, and microelectronics. Nevertheless, what physicists do today is fundamentally the same kind of activity as turning a glass of icewater to see where the rainbows come from. The world we were born into happens to be a strange one, but what might we have expected instead? The only real separation, then, between a physicist’s knowledge about the universe and a layman’s is depth. That’s okay: it’s fine for a doctor’s knowledge about bodies to be deeper than mine, but I still want to know a little about how my body works. The idea that physicists can build huge instruments to study nature and then say, “It’s too complicated; you wouldn’t understand," is like sailors mounting an expedition to new continents and returning only to say, “You’d have to see it for yourself.” I think it’s part of a physicist’s job to tell the wonders of yonder shores. This website is a personal account of what I’ve learned and what I’m learning about the idiosyncrasies of our world. As a teenager, I read lots of popular books on relativity and quantum mechanics and was dying to find out about this stuff for myself. What I found was more comprehensible and more amazing than they made it out to be. It’s true that much of what I learned could only be fully communicated in the language of mathematics, and most people don’t have the mathematical background to communicate that way, but what stuck with me the most in my travels were new metaphors and pictorial representations of the phenomena. That’s what I want to share with you. After all, even a formal mathematical model is a metaphor. Some of its aspects communicate the truth of what it represents and others would be misleading if taken literally. The classical mechanics I studied with such sweat and labor as an undergraduate communicates important truths about big things, but can’t be taken literally at the quantum scale of atoms and electrons. And even the most state-of-the-art model of microphysics, the Standard Model, is itself expected to be inapplicable at very small scales. The most important part of using metaphors, whether mathematical or whimsical, is knowing how they apply and how they don’t. As long as we do that, there’s nothing disingenuous in me saying that nuclear fission reminds me of hard liquor. It’s just less detailed than a scholarly lecture would be.